ISPAC-2012 will be held at Rolduc Abbey, in Kerkrade, The Netherlands. With due respect to tradition, the former monks’ dormitories have been converted into a modern-day hotel. To see detailed information about accessing the hotel, please, visit the menu Venue on the left side. These rooms are with own shower and toilet facilities. 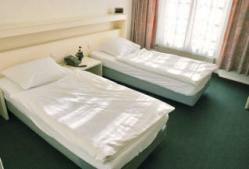 Double rooms, single occupancy including breakfast: € 60.00 p.p.p.n. . If occupied by two persons, the charge includes € 42,50 p.p.p.n. including breakfast. Double rooms, single occupancy including breakfast: € 55.00 p.p.p.n. If occupied by two persons, the charge includes € 29,50 p.p.p.n. including breakfast. facilities; and larger rooms shared are available for reduced price. Please, mention ISPAC 2012 in your e-mail. The hotel reception closes at 23:00 daily, if you plan to arrive later, please contact the hotel by phone in advance. They will make sure that someone will be available at the reception to accept you! The arrangement and cost for accommodations are the responsibility of the participant.